Plus Size Palazzo pants flatter the body because there’s natural movement in the slacks’ design. When you look at them they seem to whisper of the era of flower children with their vibrant patterns and geometrics. In fact, Palazzo pants were very popular in the 1960s as well as the 30’s and 40s when the large flaring leg created a nearly skirt-like appearance. Pictures of unconventional, popular actresses like Katharine Hepburn often show them wearing the Palazzo pants. In most seasons. Plus Size Palazzo Pants are wide leg pants that are mostly used for dressier occasions. However, they are currently very trendy and are available in many different colors and prints. For Special Occasions, look for pants that have a great flow & drape to them in fabrics such as chiffon, Georgette, crepe or a slinky type knit. These pants look great with Plus Size Beaded Tops. Like Palazzos, Plus Size Special Occasion Pants may have layers, slits and are generally wider and more flowing than regular Women's Plus Size Pants. 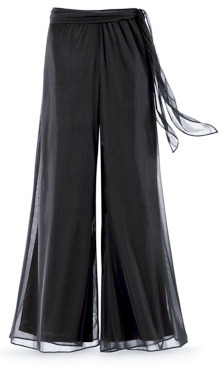 Plus size Palazzo pants differ from both gauchos and bell bottoms. Gaucho pants only reach mid-calf. Bell bottoms begin flaring below the knee. By comparison the Palazzo pant starts expanding from the waist downward. And unlike harem pants the bottom remains open rather than cuffed. The style is very forgiving for women who are insecure about a heavy bottom or thighs. This style of trouser has a definite feminine look. They’re soft on the eyes and waive gently with a breeze. 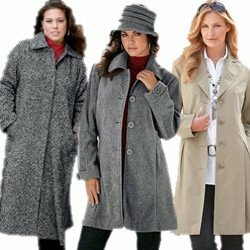 You’ll find the plus size styles go on easily. Once in place you’ll look like you’re wearing a maxi-skirt but still have the comfort and flexibility pants afford. At first look you might think that the Palazzo style would make you look larger. Nothing could be further from the truth. In fact they naturally seem to slim hips and thighs while accenting the positives and making our legs appear nice and long. Hint: Wear heels with your Palazzo pants. This particular style gives your frame a stretch, and then wearing heels makes you look even taller. The plus size slack should just touch the floor when you have your shoes on. Pair the pants with a top that matches one of the color profiles in your slacks. Likewise pick up one or two colors in your accessories to pull the whole outfit together. A fair number of Palazzo plus size pants have spandex, so they fit just the right way. They’re fully machine washable and you can either wear them high waisted or fold down the top like you might a yoga pant. You’ll never grow tired of the great, bold prints and patterns Palazzo offer either. They’re just plain fun! There is only one thing that some buyers didn’t like about these slacks. Some of the fabrics are so thin as to be see through. You may need to wear something underneath depending on the setting. Other than that, they’re plenty long and made in enough varieties that you can find a plus size Palazzo pant for nearly any occasion.